These were so good I woke up 3 or 4 times during the night just to blissfully remember how fantastic they were and to be grateful that there were crumbs left for breakfast. There, I think that takes care of ‘credit where it’s due’. Line the inside of an 8-inch square pan with 2 lengths of foil, laying them perpendicular to each other and folding the edges over to form handles (so you can lift the brownies out when they’re cool). In a medium saucepan melt the butter over low heat. Reduce heat, add the chocolate. Stir constantly until melted. Remove pan from heat, add sugar, vanilla and stir well. Add eggs and beat well with a medium-size wooden spoon. Add the flour and beat vigorously for 1 1/2 – 2 minutes. Better should be shiny and smooth. Stir in the nuts, and pour the batter into the pan. Bake for 30 minutes. The center should be almost set. Do not over-bake. Cool brownies completely in the pan. Lift the brownies out of the pan and loosen the foil on the sides and bottom. You can either leave them on the foil or put on a plate. Pour the glaze over the top and smooth to the edges. When the glaze is cool, cut and serve. Heat the cream in a small saucepan over low heat. This was for a small dinner party – I cut 4 nice squares out of the center and served it with vanilla ice cream. I had the edges the next day. This was the very best chocolate dessert of any kind I have ever had, all the fancy restaurant desserts included. It was that good. Of course we worked very hard to deserve all that lovely chocolate. 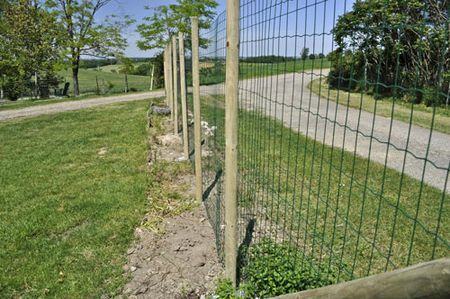 The fence is done on two sides… And he used the dirt from digging the post holes to fill in all the puppy holes. We weren’t able to teach the puppies to dig the post holes. 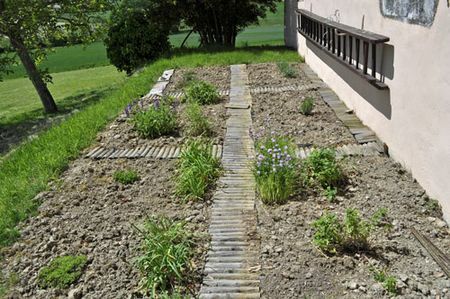 One of the reasons I wasn’t more upset about the damge they caused to my herb garden was I knew that this would happen to it – the fence went right down the middle. For obvious reasons we couldn’t put the new fence in the same place as the old fence. I was able to move most of the surviving herbs to the new garden…. 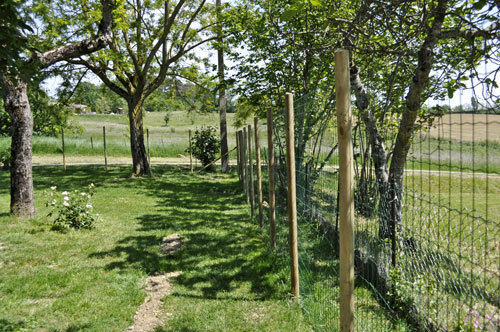 And the little wooden rabbit fence I had around the base of the old fence is making a great pathway and border. I’m still waiting for more of it so I can finish. He just started taking the old fence down. 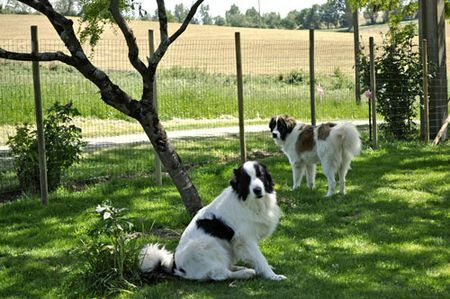 We’re hoping that the new fence will be high enough to keep the girls in. They’re not looking too happy about it. They did manage to escape today for a wee run in the wheat. There was an opening in the only section where mon mari had to take the old fence down before putting the new one up. They saw an opportunity and took it. They didn’t get any brownies. 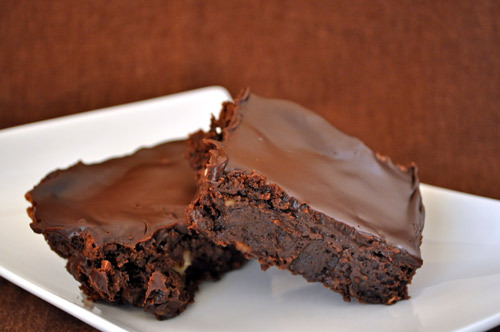 Wowo looks super delicious i love how the surface of the brownie looks. 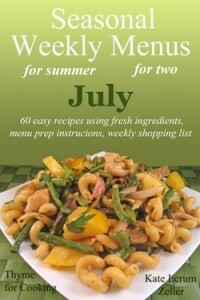 I LOVE David Lebovitz, he always has the best recipes! These brownies look amazing, you did such a great job with them. Of course, brownies have to be iced. Otherwise, they’re not finished. Not even a few crumbs for such lovely puppies? But look at those sweet innocent faces?! How could you say no. We must be on the same wave length. I made brownies yesterday and I’ve been working on my garden, trying to dog-proof it. Although, I do have my go-to brownie recipe…I’m certainly willing to give a go at another ‘best of’ recipe…especially when chocolate is involved. Those two opportunists look so cute and wicked !! 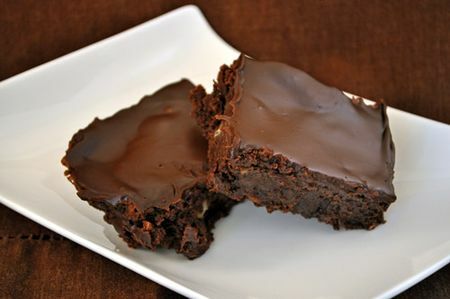 And as for the brownies – just delicious but wicked as well. Those rascal girls! Your new fence should keep them in, even with bunnies playing on the far side. Thanks for leading us to this recipe…definitely booked marked and will make them soon!! Happy Cook – it’s the glaze – it was wonderful…. Mary Ellen, I love him too, and thanks! Elizabeth, I haven’t tried the other – these are the first brownies I’ve made in years. I don’t make sweet ;-). Walnuts, of course…. we have 3 trees. Christine, thanks – on both counts. Meredith, I don’t know about Duffy…. but with my two I don’t think it’s possible…. Bonne Chance! manningroad, they will take any and every chance to get out…. And do! Erin, I do hope you were all happy with these…. Zoomie, Oh, I do hope so…. I’m getting so fed up with watching them all the time. Joey, I’m glad I found it…. Hope you like it! How can I say no to the absolute best brownies? Hmmm…I’ve gotta try this. Awesome pictures too. Poor doggies, no brownies. My yellow lab, loves anything chocolatey, and will die for brownies too…Thanks for sharing! Is there any chance a Kitchenaid stand mixer can do the vigorous mixing instead of my arm with the same results?? Love the recipe, can’t wait to try it!